NO TIME FOR DYSFUNCTIONAL WINDOWS: REASONS TO REPLACE! Summer nights on the patio with your friends and family are an ideal way to spend the warmer months. There are parties, cookouts, star-gazing nights, morning sunrise coffee breaks in your favorite outdoor chair, hammock naps, and relaxed moments taking in the view here in Toronto, ON. But, while we all love to focus on the fun and beautiful memories we will make outdoors, it is important to focus some of our attention on the patio door—the passageway to these occasions. Spending more and more time outdoors means a more frequent use of the patio door, right? Right. I say all of this to emphasize both the importance of memory-making and the importance of patio door performance, which directly impacts the many memorable summer nights for your family and friends. A quality and properly installed patio door (coupled with quality windows and an entry door) help to lessen energy bills. Have you noticed your energy bill increasing? If so, it may be time to start considering a new, energy efficient patio door (we can talk about your windows and front door, too, if need be!). 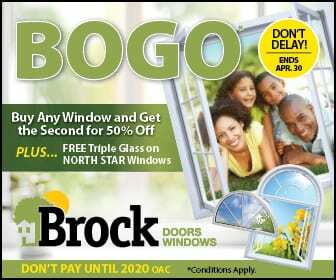 Brock’s high-performance patio doors are specifically designed with your comfort and energy savings in mind. In fact, they are designed to hold in those comfortable inside temperatures and keep out those fluctuating, often chilly Toronto temps! Stop by our showroom and let our trained staff show you about the added efficiency our manufacturers use by using energy-saving Low-E glass which features a nearly invisible coating engineered to reduce heat loss. This is a common one. Exposure to the outside elements such as heavy spring rains and our tough Canadian snows can cause low-quality patio door hinges to corrode, which makes opening and closing rather difficult. And, with cheaper-quality sliding patio doors, dirt and debris can accumulate in the tracks which will also affect good function. If you have traditional steel or nylon wheels, these can be noisy and develop flat spots over the years, which will make operation difficult. At Brock, we choose higher quality materials so your doors will maintain a perfect slide for a lifetime. Being proud of your home and knowing it is pleasing to the eye is important! It feels great to please your family and guests with a beautiful home exterior, doesn’t it? Our North Star patio sliding doors or our Imagine line of garden-style sliding doors would be a beautiful addition to any Toronto home: urban, country house, architectural, contemporary, etc. Of course, there are more reasons than these to come check out your Toronto patio door options here at Brock Doors and Windows. If you are experiencing any less-than-perfect scenarios with your current patio doors, please give our team a call. We’d love to help you prepare for summer nights outside!